Stitch Story: Cool Cat Crochet Cuffs for Interweave Crochet Fall 2017! 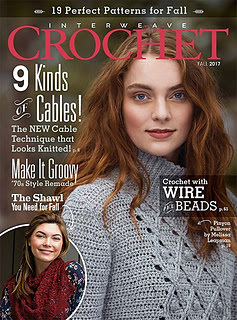 Cool Cat Crochet Cuffs for Interweave Crochet Fall 2017! Fall is my favorite time of year and I am always so happy to have designs featured in the new fall issue of Interweave Crochet! In this Issue I have 2 designs, the first of which I will talk about today. My favorite thing to design is jewelry, and I can never resist a call for jewelry designs! I also love mixing techniques, and I wanted to incorporate some weaving this time. I designed a bracelet that looked like woven links using surface crochet details. When I heard back from the magazine, they asked if I could make the bracelet into a cuff, so we decided to double the width. They also sent me a finer yarn to use, so the result is quite different from my original submission! 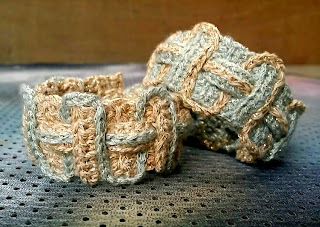 You can easily make the cuffs into a bracelet by crocheting half of the stitches. Cuff or bracelet. Customize as you like! Below is the magazine version that was put into their 70's themed section of the magazine. It is great that the editor was able to work my submission into her retro vision! If you would like to see all of the lovely designs featured in this issue, they are all up on Ravelry now. 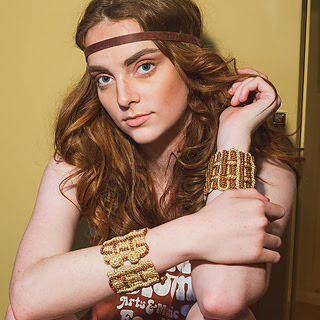 Visit the page and show the designers some love and favorite your favorites! The Cool Cat Cuff is also available for sale as an individual pattern from the Interweave online store. Shelby - Always impressed with your creativity and talent! So exciting how far you've come...and that you get to share your ideas and talents with the world! Thank you so much for your kind comments, redsrule! Teaching Art Weaving in Kuwait! Far Out Ruana for Interweave Crochet 2017!